Happy Graduation Day to me! That's right ladies and gents, I'm graduating from college today! This isn't the manicure I will be walking the stage with. Actually, as I sit here and type this on the night before this post goes live, my mind is blank as to what I'm going to put on my nails. Yup, 9pm the night before my graduation, and my nails are still naked. Ugh. These nails I loved though when I did them. 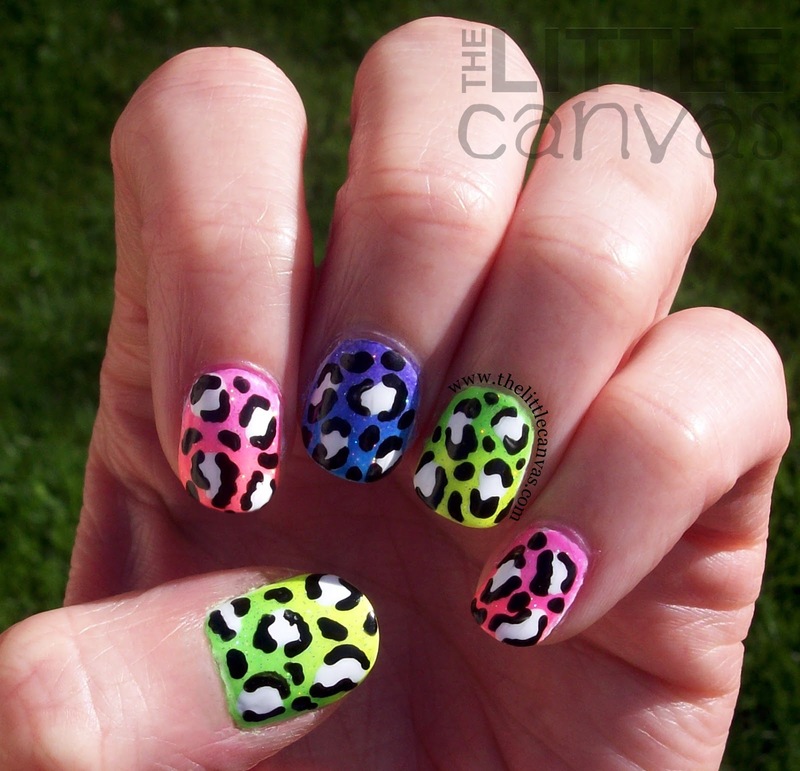 They were obviously neon, but my camera went crazy as they typically do when you try to photograph neon manis. 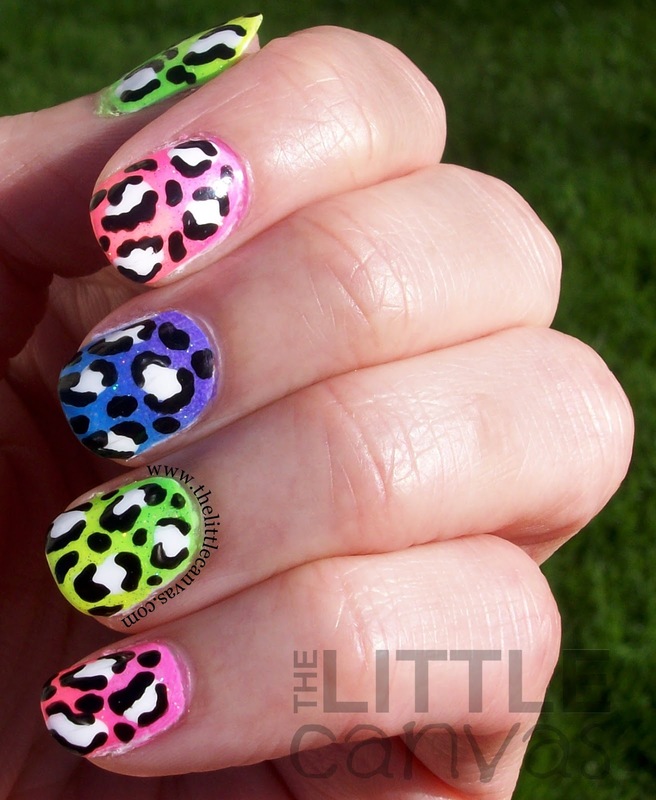 I got the idea after seeing MissJenFabulous's nails on YouTube of the extra large leopard print. I loved the neon skittle gradient with the bold print. Since I wasn't feeling the large spots, I went for my normal, small leopard print. I posted this image on Instagram and well, you can see how awesome they were while I was holding my delicious Caramel Swirled Frosty. yum yum. I decided over my gradient to add some INM Northern Lights, the best holo glitter top coat ever. Quick story before I get into my how to. I purchased this bottle at Sally Beauty Supply. After using it once, polish somehow got into the cap. Now, whenever I use it, polish drips out and all over my hand. When I close the bottle, it comes out around the cap, and literally my bottle looks like a wreck. I contacted INM and voiced my concern, and literally ten minutes after sending an e-mail, they contacted me saying that the cap is defective and they will gladly replace it. Best customer service ever. Just yet another reason why I will never purchase SV and will be sticking to my beloved Out the Door Top Coat. Start of with a base coat of white polish. For my manicure, I used one thick-ish coat. Create a two/three color gradient on the nail. To do so, paint the two/three colors on a make up sponge and dab onto the nail. Dab as many times as you want to get the color darker. If you want to add a top coat like Northern Lights of Fairy Dust, this is the time to do it once the gradient is done. With a dotting tool, dot on uneven dots using a white polish. 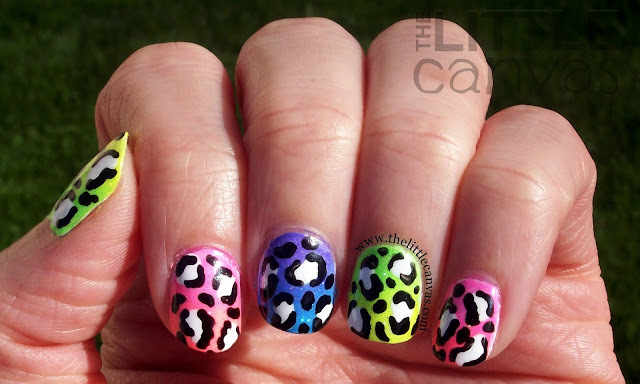 With a tooth pick or nail art brush, out line the dots unevenly as well. Do not fully outline the circles as shown in the picture above. Add uneven black spots to fill in the empty space. When dry, add a fast dry top coat. Voila!!!! What do you think? Love or hate the neon gradient? Should I try again to get better photos? Still loving the tutorials? Well, I am off to eat some food and figure out my nails for the morning. I should take an outfit of the day picture and show you the whole thing! Hmmmm. Well wish me luck and I shall see you all in a few days <3.